Grenada’s 133 square miles is composed of stunning beaches, steep cliffs, lush vegetation, rivers waterfalls, and miles of hiking trails. 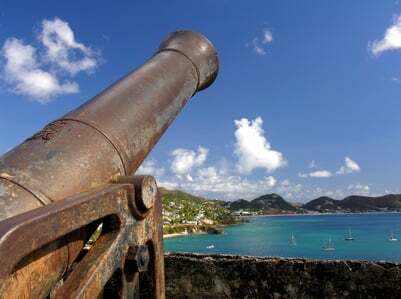 What really sets Grenada apart from its neighbors is the friendliness of its inhabitants, whether strolling down the beach or hopping on the bus, everyone greets each other with a wide grin and a “mornin.” Grenada is also known as the spice island as it produces 20% of the world’s nutmeg along with cinnamon and mace. A testament to its prolific crop is evident in the discarded shells serving as mulch in every flower bed. 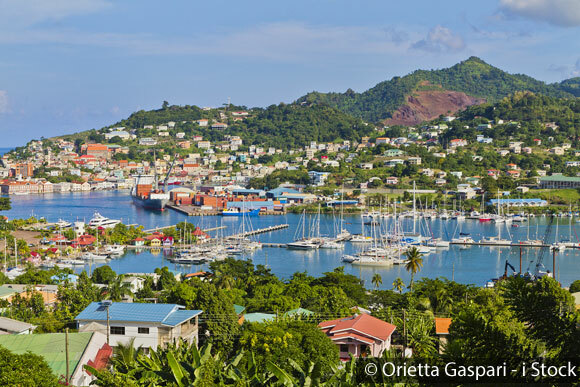 Grenada strangely enough is not part of the Grenadines although it lies only 30 miles away. It is an island nation in its own right with its sister islands Carriacou and Petite Martinique a short ferry or plane ride away. 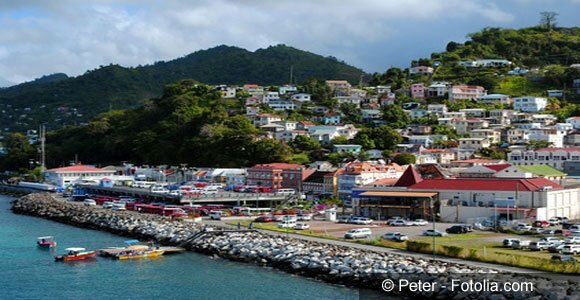 Grenada is one of the Windward Islands of the Lesser Antilles. Only 125 miles north of Venezuela it enjoys year-round tropical sunshine. It also enjoys a steady stream of visitors thanks to regular International flights from Miami, New York, Atlanta, Toronto, London, Frankfurt, and the Caribbean. For beach lovers, Grenada is hard to beat. With over 45 beaches to choose from it is going to be hard to choose a favorite. Chances are Grand Anse will be one of them. It’s almost two miles of clean golden sand, make it perfect for a stroll or a jog along the beach, to go for a swim or snorkel in the clean clear waters, and then maybe pop into one of the restaurants or bars that unobtrusively line the beach. It’s also a great spot to enjoy glorious sunsets over an ice-cold beer or rum punch ($2 to $5). Other favorites are Pink Gin, Magazine beach, and iconic Morne Rouge (also known as BBC) just over the headland from Grand Anse. Grenada is popular with snorkelers and scuba divers, thanks to clear water, shallow bays, diverse dive sites, and the world’s first underwater art gallery. Paddle boarding and kayaking are also popular pastimes thanks to the calm tranquil waters in many a bay. Hiking is a popular sport in Grenada with miles of trails meandering across this hilly lush island. Some Grenadians have taken hiking to a whole new level with the Hash House Harriers. Most Saturday afternoons, locals, expats, and visitors gather to either run or walk a marked trail in different locations across the island. There is always food and drinks afterward, a bowl of ‘oil down’ the national dish, or fried chicken ($2 to $3) and can be washed down with three Carib beers ($4). It’s a great way to meet Grenadines from all walks of life and to see the island. Belmont Estate, just an hour’s drive from the capital of St George, is quite rightly one of the islands most popular attractions. Take a tour around the gardens and discover the wide variety of plants and fruits that grow on this little island, then take the cocoa tour and see how the bean is grown, harvested, and processed. And yes, you can buy your own supply to take home too. While you are at it don’t forget to try the homemade goat’s cheese as well. What Belmont Estate also has is one of the best restaurants on the island. The airy open restaurant allows great views of the surrounding farmland where their ingredients are grown, and the varied menu showcases many of the island’s traditional dishes such as callaloo soup and papaya salad. The Dodgy Dock at True Blue Bay Resort is a happening place for cocktails, snacks, happy hour, live music, and stunning views of True Blue Bay. It is also dog-friendly as long as your four-legged friend is on a leash. If your accommodation needs are simple, Grenada can be surprisingly affordable. Thanks to its Universities, student housing is plentiful with single bedroom apartments from $500 to $700 per month. If you want a villa, a pool, and a view, rent is more likely to be $2,500 per month, mainly because these types of properties are also in demand as vacation rentals. How expensive it is to purchase a property here is driven by location. Single-family homes in less desirable areas can be had for around $200,000 and go up from there, with large ocean view villa’s costing multiple millions. Your cost of living will also vary greatly depending on your choices. Local produce is inexpensive with local fruits and tomatoes costing just $1 or $2 a pound. If you want imported apples or your favorite brand of potato chips, expect to pay at least twice what you would at home. A liter of gasoline costs around $1.50 and basic utilities (water, heat, garbage, and electricity) cost around $75 a month for a small apartment. If you need air conditioning and/or a large villa your costs will be a lot more as electricity is expensive here.